Last week for 3 days in a row, Cox was doing some work in the neighborhood so the cable was completely out. No phone. No internet. No TV. Horrors! The weather was lovely so I jumped on a couple of my back burner projects. This one is finished. It was pretty easy peasy. Just paint. This bench came from an estate sale a few years ago. It set me back a whopping $3. It's incredibly sturdy and I display plants on it out on the patio. Blah, blah gray paint. And dirt. Love it. 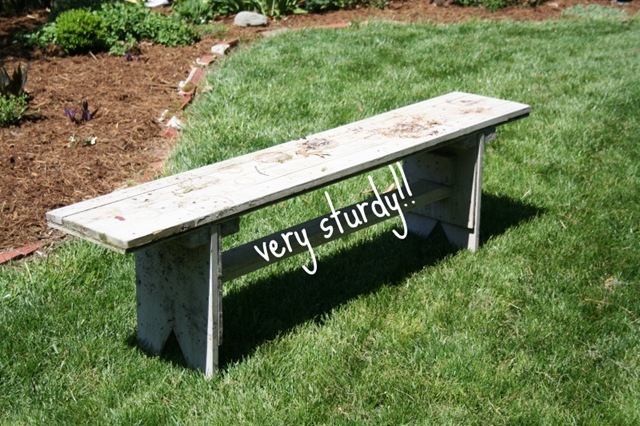 I am looking for some old benches for my flowers. I have a bunch of old fence posts and might attempt to make a couple. Love yellow paint! I really like the shape of your garden that is edged with bricks. I want to do that back by the stone wall…make a garden with gentle rounded curves. Very nice. 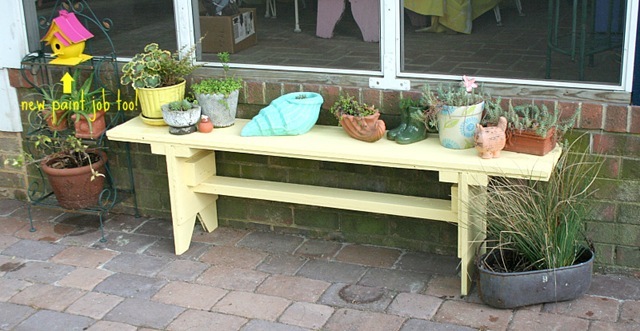 Love the bench and the yellow!!! I love the sunny yellow! You’ve been busy! And the weather’s been great and it makes you want to stay outdoors! Very nice job. I like that shade of yellow, kind of buttery. The yellow color is lovely! And the birdhouse is very south beach Miami. great job of sprucing them up! Great job-diggin on those sunny colors too!~Smiles~Tam! Ok, now I know I have to get that bench of mine out from under last summer’s clutter and get it looking at least half as good as yours does! Love the paint job! Thanks for the inspiration! Delightful and I love it!!! I love the bench before or after. Can’t find enough $3 deals these days! Thanks for stopping by to see my French Flea photos!